Banana bread is a one of my favorite snacks. We often intentionally purchase too many lacatan bananas, knowing that any overripe extras will happily transform themselves into a loaf of banana bread. There have been several banana bread recipes featured on marketmanila.com in the past, but I constantly read through any new banana bread recipes I come across, and the interesting ones will almost always get a test run. The latest issue of Saveur magazine has a one page feature on banana bread, and they included a recipe for this classic baked good… Please click on the link to Saveur for the recipe and methodology. Our results on the very first try were VERY good. A nice moist moist crumb and flavorful cake punctuated with nuts and lots of fruit. It had a wonderful color and aroma. And was just as good the day after we baked it. The recipe is definitely a keeper. We did make some substitutions to ingredients simply because we didn’t have the original ingredients in the house. Instead of buttermilk, we used a similar amount of whole milk with a teasoon of lemon juice added (though I have learned recently from a reader that Rizal Dairy at Market!Market! carries real buttermilk), instead of “3 bananas” called for in the recipe, we used 5 lacatan bananas as the Cavendish variety sold in the U.S. tends to be much bigger than local lacatans. We also used walnuts instead of pecans as we had run out of the latter. But I can see that pecans would be a better choice and would result in an even better cake. 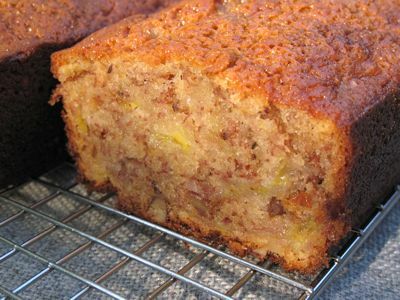 If you do bake a banana cake, make sure your bananas are really very ripe, as this will ensure better flavor for the cake. The Saveur recipe worked really well. It’s a good thing we had a LOT of overripe bananas so we made four cakes at the same time, and they were all gone within 24 hours of baking them! Banana cakes are a favorite of mine. Those photos of banana cakes look perfect! Yummy! Those photos looked good enough to eat! Thanks again for sharing MM!! Would saba be a good banana to use for banana bread? My Lola used to make the best banana bread. Seeing this post brought back a lot of nice memories! The 1st time I tried to make it, I mixed the ingredients too much and the bread turned out tough and dense. In case you can’t wait for your ripe bananas to get over-ripe, just pop them in the oven (with skin on) until the skin turns black. A good thought AC though hardly ever needed here where bananas seem to undergo accelerated browning between market check-out and home. I can only imagine how much better banana cake with lakatan would taste. Cavendish which is about the only variety available here can only play a far second (banana) to our top lakatan. My nieces learned to call them saging during their first visit to the Philippines and rave about it years later with â€œof all the bananas weâ€™ve tasted, saging is the bestâ€. 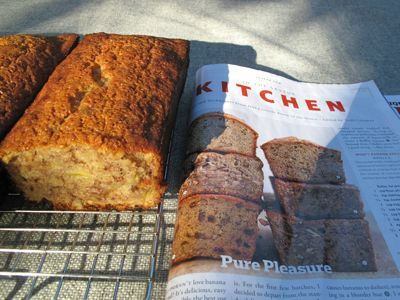 The Cake Bibleâ€™s banana cake is my default recipe since its appearance though I shall definitely try Saveurâ€™s. Their pound cake that came with your recommendation is easy to make and turns out consistently superior results. Btw, Rose enhances Cavendishâ€™s lack in flavour with grated lemon rind. Great combination. I can smell the banana bread! Yummy! Aww, same experience here. The banana bread is gone in 24 hours. I love making them for my family. Haayyy. I miss my oven. Nalubog kasi nung Ondoy. 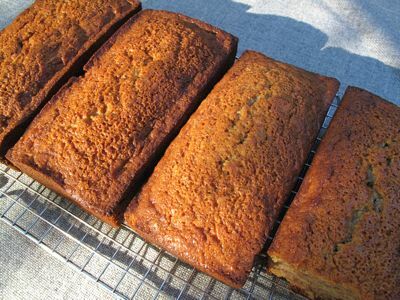 Banana bread is a favorite at our house, too! As an alternative to nuts, I add blueberries (frozen or fresh, it doesn’t matter). These are unexpected and turn out really well. My daughter loves bananas and blueberries, so she gets her very own loaf of banana bread. What a coincidence! I was just planning on making banana bread and I will surely try out this recipe because if Marketman says it’s good, it must really be good! Thanks MM. MM, do you ever adjust your baking time/temperature when using baking recipes from other (colder) countries? I usually get too dry cakes/breads when following a foreign-based recipe to the letter, so I adjust the temperature down by 2-3 levels, put the cake on the top rack and check on it regularly. They usually get done 15-20 minutes early. this is just my daughter’s favorite, i wish i could buy an oven soon to try this recipe! Kai, yes I do pull baked goods out based on instinct and toothpick “tests” and often I cook them less than suggested. However, it might also be good to get a good oven thermometer as I find they are a good way to cross-check one’s oven. Our La Germania Oven for example is roughly 30-40F off what its supposed to be at… so you may need to adjust for that. Footloose, mushy lacatans are incredibly pungent and transform into something even better when baked! Artisan, thanks for that tip, I didn’t know that one and can see myself using it fairly often! Pam, I have never tried saba but I would guess it won’t be a great substitute for “eating” bananas… romwell, yes I do use cashews sometimes which works well. I love banana bread!! I love Saveur too!! It’s such a good read all the time. These look good MM. Reading this post made me go through the archives for your poppy seed cake post..Both so YUMMY!! Sigh..
Yeah, a very resourceful way to make use of overripe bananas :D I’ve read from another blog that he does the same thing. I would love to see you make banana pudding though. is it ok to add cinnamon to the recipe? will it affect the flavor? Jing, cinnamon is pretty strong, but if you like the flavor, you might like it in your banana bread… Brian, unfortunately, I have never EATEN banana pudding, let alone make it. Mom used to use over ripe saba bananas. It makes a denser bread due to it’s starchiness but has excellent flavor. Mash thoroughly before adding. Bake your banana bread and any other pound cake type cakes at 300F for even rise and a golden crust. Even better, put a pan of water on the floor of the oven to provide moisture. Some commercial ovens can eject steam into the oven. my favorite type of bread. i have tried using banana bread for making french toast…it was divine! I will try this soon…we also love banana bread. Great tips from everyone! A favorite of ours is the dense and moist banana loaf from Baguio Country Club, and another one from a hotel bakeshop in Cebu I received as pasalubong, the name escapes me at this time. Thanks for the inspiration marketman! will try to make this! Jing: try a little nutmeg! just a little bit. OMG! I made banana bread within five minutes of getting the Saveur magazine from our mailbox (I guess noticing the browning bananas on the kitchen counter helped). I was tempted to dark chocolate chips, but wanted something fruity–I remembered some dried currants I got from Surfas in Culver City and mixed some into the recipe (about a cup), along with a handful of chopped pecans. I wanted a thinner banana bread so I only half-filled my pan (so they slice into fingers rather than squares)–and used the extra batter to make mini muffins–these little guys, toasted and spread with butter, along with a mug of tea, made for an awesome midnight snack! With your permission (plug-in) MM, I also carry real Buttermilk (from Cebu Dairy Coop) at the Sunday Market in the Banilad Town Center (in Cebu). Hi! I just came from Baguio 2 weeks ago. Read about it in my blog! I bumped into your blogsite thru technorati. @Artisan..must try putting the bananas in the oven. Can’t wait for them to get overripe. Will try the recipe today but,first, off to the grocery for some real buttermilk. I have made Peter Reinhart’s ( The Baker’s Apprentice, Brother Juniper’s Bread Book, etc.) banana bread many times and swear by it. I don’t like pieces of banana discernible in the bread so I use the paddle attachment to kind of liquefy the ripe bananas into the rest of the liquid components including brown sugar. I then slowly fold in the dry ingredients ( flour, salt, baking powder carefully so as not to produce too much gluten. When everything is evenly wet, I then fold in the nuts. This way there is no possibility of dry flour hiding in the nut crevices. An additional trick from Reinhart is he mixes the flour with the butter before he applies the resulting compond on the walls of the loaf pan. that way you don’t see streaks of white flour on the sides of the bread. I’m a banana bread fan too! I’ve discovered that the best banana for banana breads is the local green banana that remains green when ripe (similar to the one mentioned by Denise from UAE). Here in Negros Oriental and most of the Visayas it is called the Bolongan/Bolongon variety. It’s like a local cavendish variety but much smaller and so much sweeter. It definitely gives much better flavor to the bread than the lakatan. Oh and it’s so much cheaper than the lakatan too! Made this two nights ago — tripled the recipe because sayang the oven space (and you know how much the electricity is in this part of the world!). I reduced the sugar (to total of 2 1/2 cups instead of 3) and used 4 bananas per recipe. Pulled out of the oven about 10 minutes earlier after toothpick came out clean. Sarap, specially with the pecans! Banana may have been a bit too much for my taste because it was almost like pudding na. I would have wanted it more bread-y. But yummy nonetheless. Maybe I would try toasting too like 1 commenter said. Hi..I tried the recipe yesterday (10 May 2010)..and wow, it was indeed a big hit! Thanks a lot for sharing. I first tried with pecan..it was good, but people at home liked the batch with walnuts. I’ll try it next time using cashew nuts. Again thank you very much……….